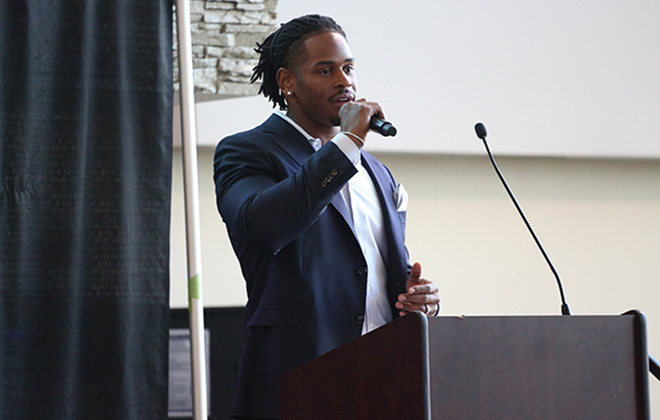 Davis served as the keynote speaker at the 10th annual event. 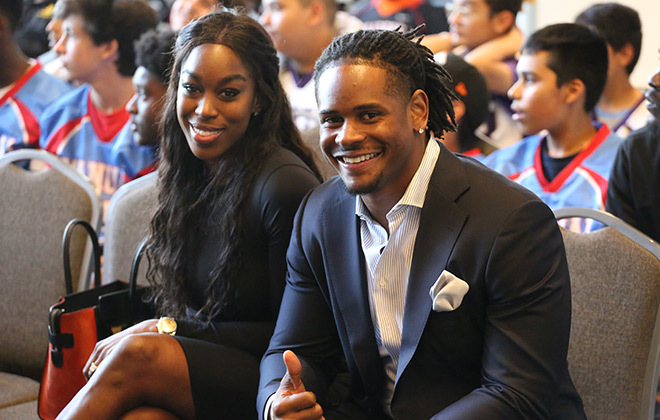 DENVER — The Broncos hosted the 10th annual Futures Football Banquet for more than 300 middle school players and coaches on Wednesday, and those in attendance had the chance to hear from two current Broncos. College free agent Phillip Lindsay, a former Futures Football player himself, spoke briefly to the young players and helped hand out awards. 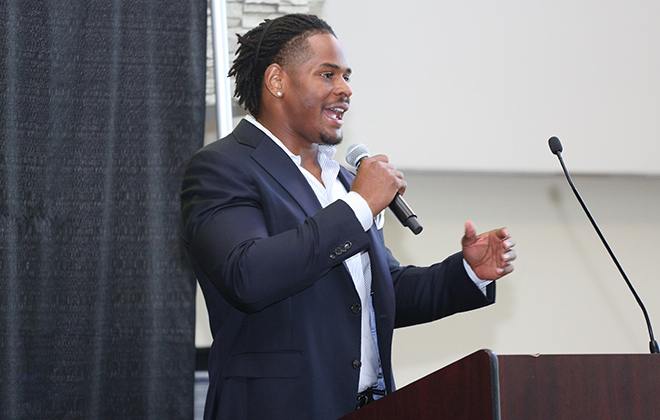 But the real star of the night was linebacker Todd Davis, who served as the keynote speaker and shared his story of resilience as he journeyed from undrafted free agent to practice-squad player to NFL starter. “What’s up, guys? How are y’all doing? “I just want to talk to you tonight about my journey and the trials and tribulations that placed me here tonight. I stand in front of you a Denver Bronco, but you can’t imagine the roller coaster I’ve been on to get here. I wouldn’t be here without hard work, faith and dedication. “I’m from Los Angeles, California, and growing up, I always had a dream to play football. I imagined myself out on the field. I would watch Ray Lewis and picture myself out there making plays, making big hits, making tackles. But there was a point in my life where it looked like my dream wouldn’t become a reality. “I went to a small high school in California, and they weren’t really known for producing good athletes. But in spite of that, I worked every day like I was on the road to the NFL. I stayed after practice and did extra, I came early to prepare for practice every day, and as a result of all my hard work, I earned All-State and All-Conference honors during high school. “But in my senior year, when I was supposed to be highly recruited and signing a letter of intent, it seemed like I was unwanted. I had nowhere to go. It seemed that my dreams just wouldn’t become a reality. But I just couldn’t stop. I wanted it too much. And personally, I feel like whenever you want something a lot, you’ll do whatever it takes to get it. “So my dad and I, we got to work. We started calling schools, we started emailing them, sending them my highlight tape — anything for them to take a look at me. And once again, I felt like I was getting no love, like no one wanted to take a shot on me, no one wanted to take a chance on me. Nobody even wanted to look at me. Coaches even told my dad that they don’t recruit my area. I mean, it’s crazy. How can you not recruit a whole area? You don’t know where the talent is coming from? It was heartbreaking, sitting there fighting for myself when I felt like no one wanted to give me a shot. But I continued to work hard so that when I did get the call, I was ready. “One day, I got a call from Sacramento, California, that forever changed my life and propelled me to the stage that I’m at right now. It was a call from Sacramento State University, which at the time I had never heard of. And I’m sure a lot of you have never heard of it. I was a little ungrateful about it. I felt like I had worked too hard to go to a school I had never heard of. I wanted to go to USC, UCLA — a school with some tradition. Somewhere that I could really get a shot at the league. “But God had other plans. So I go to Sacramento State with the mentality that my dreams are still in my hands, that I’m still going to make it to the NFL. My story’s just going to be a little different. When they do the ‘E:60’ on me, they’ll just talk about Sacramento State instead of USC. And it was crazy to think like that, because at the time, Sacramento State had no active NFL players. So if I wanted to break the mold, it was going to be tough. “But I had some great people around me, some people that encouraged me — some great coaches, some great teammates, some great mentors. They encouraged me not to give up and work like I was at the school of my dreams and let God take care of the rest. “I had the faith, I just had to put the work in. Because faith without work is dead. The first step is the desire or the dream to be a great football player, a great man, a great father, a great teammate. But you have to put actions behind those thoughts. Are you the first one in the building and the last one to leave because you want to be great? Are you listening to your parents when they ask you to do something like take out the trash? Are you doing the right thing when no one is looking? Are you pushing yourself in the weight room just as much as you’re pushing yourself in the classroom? Because being a student-athlete is a total package. “You must be willing to work for whatever you want in life. If being great was easy, everyone would do it. It’s easy to quit. It’s easy to give up. It’s easy to look at your circumstances and make them the reason why you can’t achieve your dreams. “Statistically, I’m not supposed to be here. I’m not supposed to be a starting linebacker for the Denver Broncos. I’m not supposed to just have signed a long-term contract with the Denver Broncos. I’m not supposed to be in front of you, but I didn’t let my circumstances stop me. “That leaves me to say this: Being great is tough, but it’s not impossible. Because those who make the conscious decision to work hard, have faith and be dedicated, achieve greatness. And I haven’t achieved greatness yet, but I won’t stop until I do.